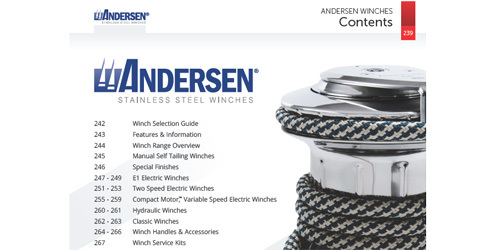 The new 2017 Andersen Stainless Steel Winches™ Catalogue is now available in Acrobat PDF format here Download the Winch Catalogue. The PDF version is ideal for downloading to your device for use when not connected, or to print a hardcopy to keep on board or in the workshop. It contains all of our winch range specifications, and service kit and accessories information. To assist with selection there is also a comprehensive Winch Selection Table and handy at-a-glance range Self-Tailing Winch Range Chart. The two new models are 34ST and 50ST fit nicely into the Andersen range of stainless steel winches. Both are available in Full Stainless and Black Trim versions. Choose the right winch for your boat with our Winch Selection Guide.